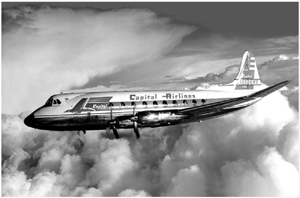 Capital Airlines Flight 20 was a regularly scheduled passenger flight from Chicago Midway Airport to Norfolk, Virginia. A stopover was made at Washington National Airport. During the stopover at National Airport, N7462 was substituted for the original airplane. Flight 20 departed National airport at 2140 with 46 passengers and a crew of 4. The flight was on an IFR (Instrument Flight Rules) plan with a cruising altitude of 8000 feet. Icing conditions were forecast for the route of flight. At approximately 2205, four minutes after passing Tappahannock low frequency range, Flight 20 acknowledged a clearance issued by Norfolk Center. This was the last communication received from the flight, at which time there was no indication of any difficulties. Approximately 14 minutes later, the aircraft crashed and burned near Charles City, Virginia, killing all persons on board. The Civil Aeronautics Board (CAB) investigated the accident and concluded that the accident was caused by the crew's delayed arming of the engine ice protection systems while flying through icing conditions. This resulted in flame-out of all four engines, and automatic feathering of all four propellers. This condition existed for a sufficient time to cause a drop in battery energy, inhibiting the unfeathering of sufficient engines to maintain flight.